How do you Unlock Hero Weapons? Splatoon, the first game was originally released on the Wii U in 2015. 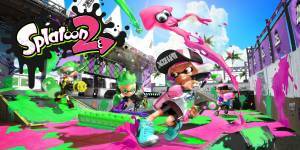 The sequel, Splatoon 2 has been relaunched on the Nintendo Switch and feels like a completely new game when compared to its predecessor. The objective of this non-violent team-based shooter is still the same, you use vibrant, ink-based weapons to splatter both enemies and the ground alike in your team colour to control territory. There are plenty of ink-based weaponry to choose from and each type has distinct uses. A new array of special weapon powerups have been added to the sequel along with a set of gear that provides both style and bonuses in combat. Also added are over 20 random secondary abilities that unlock after you have battled with them equipped enough times. The single-player campaign has 32 missions which has you running and grinding on ink-rails through eight different maps spraying ink while searching for collectables. Multiplayer mode is the new Salmon Run mode where up to three players must go against three timed waves of relentless enemies while collecting a quota of golden eggs from boss creatures and depositing them in a basket. There are a variety of online modes that change every two hours that includes Turf Wars, Ranked and League Battles, Splat Zone, and Tower Control. There is also a multiplayer mode that can only be played online on certain days for specific amounts of time. How do you Unlock the Bonus Weapons? How do you Unlock Additional Gear Ability Slots? Where are the Hidden Sunken Scrolls and Sardinium? What are the Abilities you get from Wearable Gear? How do you Unlock Crusty Sean's Food Booster Items? How do you get Ability Chunks? What Gear and Perks can you get from Amiibo Scans? No discussions open for Splatoon 2 at the moment.